This situation is more of just a few cracks and not the most urgent of damages. The insurance agency will typically take care of this and it won’t backfire on your record. This is when the windshield is really damaged and may be affecting safety or vision. This is usually urgent and needs to be fixed right away. The insurance will typically cover as much as it can, but the one impacted will need to pay some out of pocket. This depends on the evaluation. 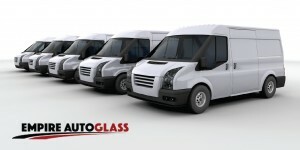 Fleet services is considered a specialty for auto glass perfection. Empire Auto Glass services the glass needs for large firms and small contracted firms such as schools, security organizations, freights and more. We will also pre stock inventory to match specific glass needs. This can eliminate costly down times and lows in production or even limit back orders of production. Empire Auto Glass fleet will service your auto glass even during afterhours. That is how dedicated to customer satisfaction we are. All our technicians are well trained and able to handle any of your auto glass problems. They are certified and operate with the finest equipment for the best results. Fleet Management can operate on any mobile vehicle, domestic or foreign. It you think that it is not in stock, give us a call. Buses come in all shapes and sizes. Some are small and some are very big. Empire Auto Glass can customize a service solution and schedule a repair time on your schedule to meet expectations by calling 703-573-7700 or 301-830-6262.